Personally I was happy with the cooler than average summer we were having for most of June and July, but my tomatoes have really appreciated the heat and humidity of the past week. 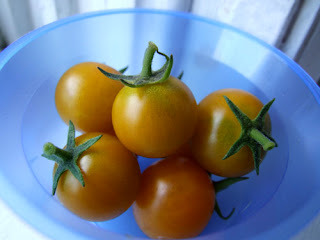 I've been able to harvest a couple handfuls of Sun Gold cherry tomatoes so far, and my so-called Early Girls are starting to show some color now, too. My cucumber isn't doing to well; most of the fruit rotted on the vine, and the one that got to harvestable size was dry, dense and mealy. Cayennes are coming along beautifully, however, and I have a dozen or more fruits on my one little plant, although they're all still green. Made a batch of pesto with the basil, and the plants are coming back now so that I'll be able to make another batch in a few weeks; parsley and rosemary are thriving and have been harvested in handfuls here and there as needed. I'm going to start fresh pots of basil, dill and chives soon (although maybe not until after I move--first week of September, eek) to try to carry them through the winter. Dahlias, callas, snapdragons, zinnias, fuchsia, bee balm, bergamot, black-eyed susans, evening primrose and anise hyssop are all blooming now, much to the delight of local bees and hummingbirds.